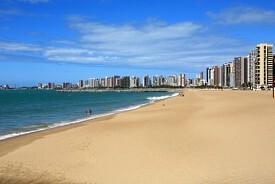 Gorgeous golden-sand beaches stretch along the coast of Fortaleza, and the local crafts are excellent. Most excursions include a shopping stop to pick up embroidered linens, leather goods and wood carvings, and a visit to a museum. Some tours include the Coco Ecological Park or the Teatro Jose de Alencar.